hilltop location, there is a constant ocean breeze into all rooms. under a palapa, on a quiet residential street. at tree-top height and 360 degree views of the valley and jungle. away. Rent the villa be itself, or with one or both casitas. the rental, but lots cheaper than renting from an agency. special secured window system, electronic wall safe. accommodation as if it were your own home. palapa - with a peek-a-boo ocean view. system, electronic wall safe, and wireless DSL Internet connection! 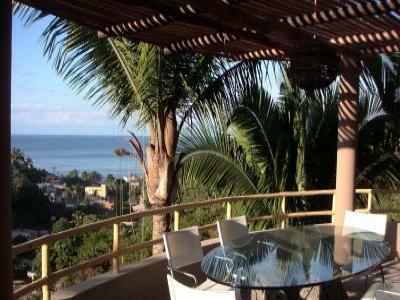 in Sayulita - you’ll get a lot more for less money. while you relax on the beach sipping Margaritas. you can try it on your own by renting a surfboard for $5 an hour. You’ll discover what it’s like to ride a wave standing on a board! longer but you’ll get some flavor of Mexico life. drive to Sayulita just to dine at one of the many popular eateries. to Sayulita is your chance to relax and soak it in. skills! It will be one of your very best vacations! CONTACT US FOR MORE INFORMATION AND PICTURES ON OUR WEB SITE. Monthly Rate: $2,850 month ($95 additional nights). Monthly Rate: $1,250 month ($40 additional nights). railings, make it less desirable for young or unsupervised children. Casita Libertad also has railings or low walls on high terraces.